At just 25, Chandler Wiegard and his fiancee have just moved to Connecticut but they already have a 250,000 reasons for loving the state. Easton resident Wiegard went to the OHM Grocery Mart on the Boston Post Road in Orange to purchase lottery tickets. While there, he even let a woman get ahead of him in line, just trying to be nice he says. Both he and the woman bought $250,000 Cashword 3 game tickets. When he scanned the tickets, at first he thought he got it wrong. But it turns out he was right all along. He had won the game’s $250,000 top prize. Seems like his small act of kindness led him to a quarter million win! 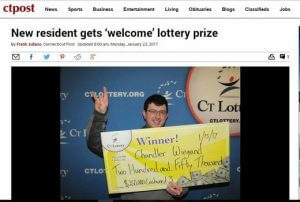 He later went to the lottery offices to claim his prize, until that time he has kept the win a secret from his fiancee. He says he wants to use the money for the house, to pay off bills, and to save for future children. The OHM Grocery mart was awarded $2,500 for selling the winning ticket.